I mourn thee Mr. Nimoy. Once again, we measure our own time in this life relative to those who we respect and idolize and how the latter inevitably leave us in our and their mortality. Star Trek means a great deal to me. I love and continue to love Star Wars. The Trilogy is my childhood love that I grew to appreciate more as an adult. Star Trek is a childhood crush that developed into a more mature love. Both will be with me forever. Trek has also guided me through those moments where childhood innocence was lost. I quoted Mr. Spock and his plain statement of fact and loyalty to Captain Kirk when I gave the eulogy at my "brother's" funeral. I watched the original Star Wars Trilogy in a marathon session the night before my father's funeral. I was in my early twenties for my first major loss; I was in my thirties for my second major loss. Trek and Star Wars were appropriate comforts for both moments in my life. Leonard Nimoy, the "mulatto", "half-breed", human-Vulcan second in command on classic Trek is one of the greatest and most iconic TV (and film) characters of all time. It was perfect that Leonard Nimoy a Jewish-American brother would play Mr. Spock a half-human half-Vulcan character on Star Trek. In all, Mr. Spock and Leonard Nimoy are Titans of global popular culture. For those of us born on the other side of the colorline--in the chocolate part of town--Spock's wisdom and the Vulcan way affirmed something we always knew about our contributions to America's "mulatto" culture. Black American culture is American culture. We have given many gifts to America--most of them unacknowledged and not returned in kind. Moreover, America's diversity is her greatest strength. Our forward thinking white brothers and sisters know this to be true. Other enlightened people of color know this to be true. Our gay and lesbian and transgendered brothers and sisters know this to be true as well. When the appropriate moment avails itself, I instinctively greet people with Mr. Spock's iconic hand gesture, pinky and fourth finger together, index and middle finger together, both separated in a "V", and the thumb also extended. We say "live long and prosper" while making this gesture. There is a deeper meaning that those outside of Star Trek fandom may not be aware of. Spock's gesture is an embodiment of the Vulcan belief in logic and what is known as IDIC--"infinite diversity in infinite combinations". Spock elaborated on the philosophy of IDIC in more detail during the classic Trek episode "Is There in Truth, No Beauty?" The triangle and the circle... ...different shapes, materials, textures...represent any two diverse things which come together to create here...truth or beauty. In its own way, this is a motto that has united all of us who fight and struggle for a humane and cosmopolitan world. I would also like to believe that Brother Dr. King is connected to Brother Leonard Nimoy through that common vein of belief and energy. I never had the good fortune to meet Leonard Nimoy at a convention or other gathering. I wish that I had done so. He is a friend that I never met, but felt that I knew, as Mr. Spock and IDIC were shining beacons and guides for those of us who walk the colorline while trying to make sense of it. IDIC is also a guidepost for those folks who because of some arbitrary and random ascriptive trait identity trait feel like perpetual outsiders as the Other in a world and society that can often be so very cruel to them and us. Unfortunately, those who are intolerant, racist, bigoted, prejudiced, white supremacist, homophobic or xenophobic have not surrendered to the logic of IDIC. They are lost souls. Goodbye Mr. Leonard Nimoy, you have been and always shall be my and our friend. You are irreplaceable. Chauncey - you can give my eulogy too! Rest in peace Leonary Nimoy. Star Trek had no lasting impact on my life whatsoever (/s). That said, of all the ST characters I grew up with I wanted to be Spock most of all. The galaxy just got a new star in the heavens today. Live long and prosper. I was nine years old in 1967. I have a clear memory of creating a MR SPOCK halloween costume with the help of my mom. (blue v-neck shirt, black pants.) I remember cutting cardboard into a starfleet badge. She found rubber pointed ears. I went door to door as Leonard Nimoy that year for Halloween. I was an avid reader of MAD magazine. They did their Star Trek parody; I think it was called "Star Blecch" or something like that. But what thrilled me was the next issue... apparently Nimoy and Shatner saw the parody, and wrote a letter. They enclosed a photo of the two of them, in costume, reading the MAD issue. Spock was smiling! Spock was sort of the calm male adult that was lacking in my family. He was sort of the wise father figure, because my own was seriously messed up from war and alcohol. Somebody tweeted today "Grief is logical." I agree. He was wonderful. Such a teacher and role model. Mr. Nimoy was also very playful. I will be watching his Bilbo Baggins music video later today while drinking a bottle of Chimay to honor him. Emotions. A hell of a thing, no? If you haven't read some of the early Trek novels about IDIC and Spock's childhood check them out. Great stuff. 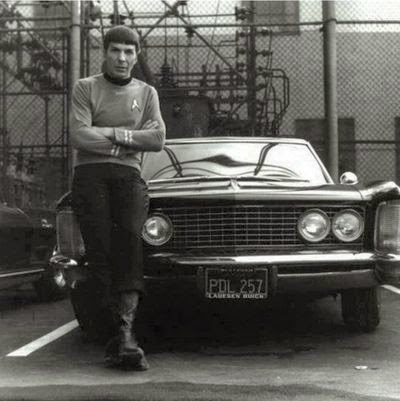 Mr. Nimoy was a bright star in the galaxy. Just trying to write and speak from the heart. Thank you for the kind words. What are your feelings about Mr. Nimoy? I would be curious to read them over at your great site. You have a wonderful voice for these types of reflections. Live long and prosper brother Nimoy. I am going to be watching a bunch of Trek today. What are your favorite Spock episodes or moments? The net is full of Nimoy memoriams today. Yours is my favorite. He had a great and fun soul. "I am not Spock!" You flatter me too much, I couldn't top this. When I saw the news I actually blurted out "oh my God!" I am a moderate fan of Trek, but a big fan of his. I might actually write something about his music, which I find oddly attractive despite the limitations of his voice. Well besides his iconic death speech in Wrath of Khan ("I have been, and always will be, your friend"), I was always partial to the way Spock fudged the truth rather than lie (as Vulcans were supposedly incapable of deception). I thought it was kinda cute how his human half crept in like that, like Kirk brought such out of him. I grew up watching Star Trek as a kid. Mr. Nemoy shall be missed, not just for his acting talent but for his kindness, his feminist principles and his devotion to goodness. If Batman taught me how to fight for what I believed in then Captain Picard and Mr. Spock taught me the value of temperance and wisdom. A wonderful tribute to a great man and actor. I, too, admired Leonard Nimoy and his alter ego Dr. Spock. His last tweet sums it up for those of us still here...hoping to "live long and prosper" and that is... "Life is like a garden. Perfect moments can be had but not preserved, except in memory". I appreciate your website and the very few times that I disagree with a viewpoint; critical thinking follows and I remain open to perspectives and another way to view this challenging and sometimes magical journey we refer to as life. Peace. I second this! Well done Chauncey! The best episode of Star Trek was Mirror Mirror. It showed the fascism implicit in the fictional JFK liberalism of the Federation. The *only* character in the alternate, fascist universe who wasn't a total Nazi was Spock. Brains/Outsider status prevent you from becoming a complete imperial stooge. When Paramount bought the rights to Interview With The Vampire in the 70s, Nimoy was very eager to get the part of Lestat. Somewhere online there's a photo of him dressed up in Victorian vampire garb, part of his effort to lobby the studio, looking like an angular Jonathan Frid. And that's what struck me about how wonderfully serendipitous success can be in America. With the possible exception of Shatner, all the cast of Star Trek were workaday character actors, hardly any glamour among them at all. Ordinarily, they would have toiled along in the industry in bit parts, little noticed, a cowboy sidekick here, a detective's by-the-book boss there, a few stints on the dinner theater circuit, before fading away. But instead they became one of the most iconic TV shows ever, their characters far overshadowing the rest of their careers. I'm glad that Nimoy finally accepted his pop culture god status--I remember the original series, dimly, and I'm glad that it still speaks to the succeeding generations.